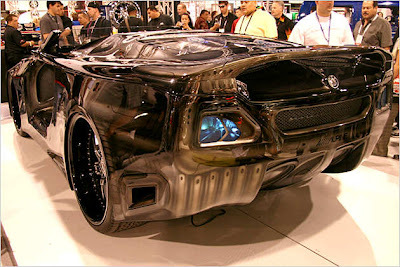 13 Above: The Lord Of Darkness - The Evil Car ! 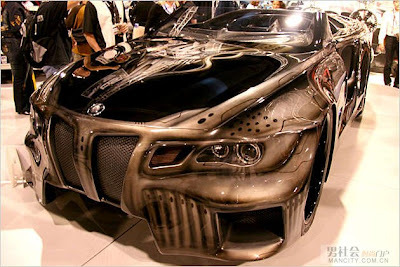 The Sinister Six is the latest project car from Team Alpine also known as the lord of darkness called Alpine BMW 645i Sinister Six. The dark Sinister Six is based on BMW 6 Convertible car. The BMW 6 Convertible is an elegant, retiring car that is attractive wherever it moves. Its stylish design attractive for everyone hides also another secret – a 4.8 liter V8 engine producing the maximum output of 367hp (270kW) and this power can boost the car to 100kmph in 5.7 seconds. Developed to showcase the firm's high-volume capabilities, it's based on a 645Ci, but none of the standard bodywork is left and the one-off model is 22cm wider than the showroom version. 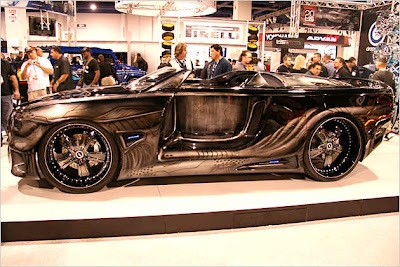 Unique 24-inch alloy wheels on the front, massive 26-inch rims on the back and airbrushed bodywork complete the comic book looks. Alpine, a Japanese professional in car-audio stuff, knows very well why they’ve chose the BMW 6 for its showcar. This company was founded in 1967 and it’s based in Tokyo. 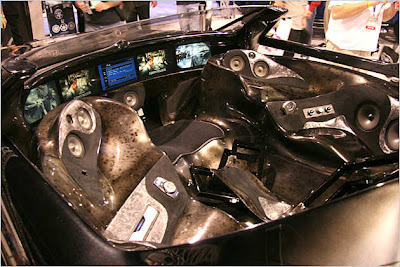 They work on audio systems for cars like head-units, speakers, and stereos with DVD and satellite navigation and much more. They do their job perfectly and this is frequently proven by many awards and satisfied customers. Despite its increased width, the big coupé has room for only one person. 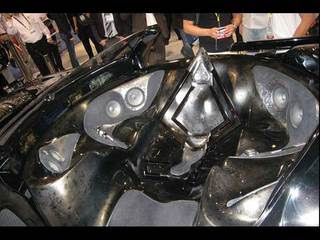 However, climbing inside is like boarding a sci-fi spaceship, thanks to the circular cockpit which rotates automatically as the rear bodywork slides backwards to aid entry. Once inside there's no steering wheel, so changes of direction are made using a computer-inspired joystick. Five LCD monitors replace the conventional instrumentation. Music fans will welcome the powerful 8,000-watt sound system, which ensures that you will certainly hear the Sinister Six coming before you see it.